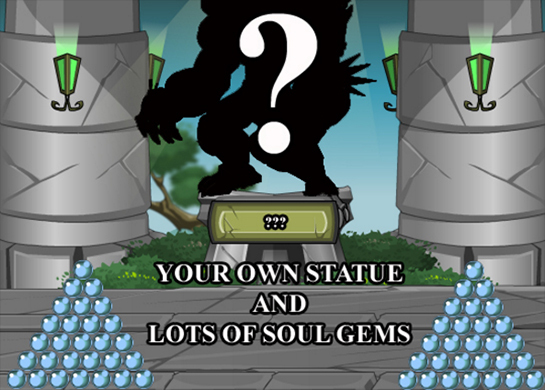 The winner will unlock a special boss fight against the most powerful weapon in Oversoul, Nulgath's Shadow. 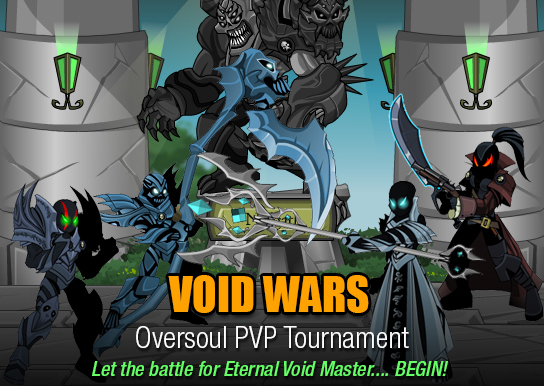 Sign up for the tournament in the Void Wars Sign Up Thread on the Battleon forum. Sign ups will last one week. Prepare yourself and your character(s) for Void Wars while you wait for sign ups to end. Check the =OS= Tenth PvP Tournament Void Wars for who you be assigned to fight and general tournament updates. We will also private message you to assign opponents as well. Show up to your fights, have fun, and win. Be the last one standing and win the tournament. Follow the instruction we send you about the Boss Fight. Slay the Boss and win it all! *Make sure you review the forum rules before posting! An epic tournament MUST have epic prizes! Below are the rewards for those who are triumphant in the Void Wars. All this and more can be yours. Statue of a character you used in the Void Wars to be placed in the Solace Zone. Good luck to you all, sign up while you can, and we will see you on the battlefield. Good question! 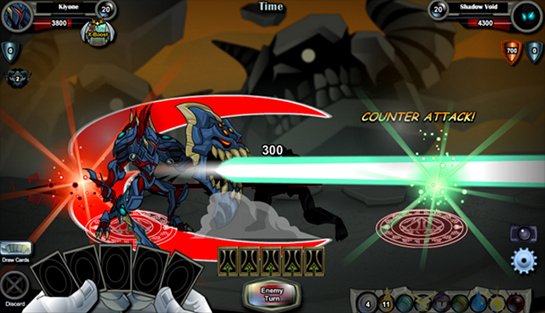 If you're just joining us, you might not have heard about the OTHER dimension/game Nulgath the ArchFiend rules. Oversoul is a free online PVP battle card MMO (phew, that is a LONG description) where you collect cards by battling over 190 monsters and other players in turn-based combat. t has been months since the great archfiend has been seen or his presence felt. Since he entered through a strange portal years ago, the land and its inhabitants knew no peace, knew no quiet. Some joined him in his quest for dominion in exchange for power while others banded together in defiance of his rule. Countless on both sides were slain, leaving their souls to wander aimlessly until they were able to inhabit a vessel. From the simple insects to the mighty dragons, from village peasants to the highest ranking of the archfiend's void soldiers, these oversouls grew in number and grew in strength; some still serving their master even in death, while others quietly awaited for their chance to strike him down. But in the recent months, there has been silence. The fighting stilled, and even the land itself held its breath, awaiting the moment when he would strike again. But he never did. Rumors filled the minds and mouths of great and small alike. He had finally been struck down. He returned through the portal to the land from whence he'd come. He'd been imprisoned, trapped, in the very dungeons he'd created. Some believed he'd been summoned by his great master, Adimonde. But no one, not even his generals, knew the truth of his whereabouts and as the time of his absence grew, the land became increasingly restless. Now war has come again, as every oversoul battles their fellow spirits for control of the realm. Some fight for freedom and glory, others for power and selfish gain. Only one will rise above the rest and claim the realm for themselves, taking the archfiend's place as ruler of the oversouls. If the void pirates win I see a powerful void captain having to be created to be the leader of the void pirates. Several of the other voids could possibly be standalone bosses such as Hex Void and AP. I only see DFR as a legion of themselves and if dread hound some how wins it would require a new form, but I see them on the side of the Nulgath supports in this war. Other ideas include Nulgath in his new form going after his master with a option to join his side to help him do it. Another once the tournament is over the shadow of Nulgath takes over the body of the person who fights him and they become the new great evil in Nulgath's absent. These could be used as Arcs. The slaying of shadow Nulgath being the thing that releases the orbs in OS which have to be collected by his side to awaken or free him. <---- This situation his master seals him after "loosing" to Dage. All the elements combine to create void energy. HA! A shadow! That pathetic archfiend is far too weak to show his cowering face! I knew it! AHAHAHAHAHAHAHA! The winner may fight his shadow, but someday, I will take on the real Nulgath! Keep that in mind mortals! Can you add onto the convo instead of adding a random kill Nulgath thing? This is a good time to start a convo about what could possibly be future of OS GQ. As you wish... I think if the new game lead (Galanoth) doesn't get too busy with other projects, we may have a chance of getting updates again. Galanoth is the liason for the OS game but both him and warlic are coders. We have no guarantee of who the lead for OS is cause its possible not to have a game lead if the community is to small. Blackshock animation skills are lacking Blade for lead artist and blackshock as possible back up that blade animates work for. Nulgath is still making characters for OS if you didn't know its just not 100% said but he has made several characters that people can do whatever they want with just give him credit. OS for example. He said he'll start doing more backgrounds similar to the ones in OS. Yeah, Nulgath has made Void Monk (he'll be creating several color variants) and a Futuristic Polish Hussar. So Nulgath is technically still working on Oversoul. Why can't he just come back? Nulgath does not work on Oversoul. He creates art to put up on Patreon. I worded it wrong my bad. Nulgath isn't associated with AE at all but the stuff he's working on have the same art styling as OS and he's willing to let people use them. If a player wanted to they could easily give it to someone AE related to put in OS they just need to give him the credit for making it. Figured out a end result for most of the Void characters . Blood archfiend being one of my favorites with valdis as his 2nd in command. Ogres follow Klunk who works for Nulgath so they follow Nulgath by association. Thrak name refers to Nulgath. Taro is associated with Nulgath in AQW. Really, you let Skexis in but ban battle cat? Do you have any consideration for balance? How much ranting do I have to do about how iron hide is overpowered, especially against other shadow characters that primarily use DoT? You don't remember how the finalists in the shadow tournament were all poison drakes? I know the tournament is mostly for fun, but I can't really have fun when I know one or a few characters are going to dominate the rest of the opponents because of the ArchKnights' decisions. You always could use infernal fiend against Skexis. Eh, yeah, iron hide is not as strong against fire, but isn't shadow still a stronger element? On the Ogres were following Oversoul storyline which has so far show they are their own group and not align with Nulgath. Regardless of Klunk story line in AQWorlds with Nulgath. At this time he is own leader with his own forces. So the ogres are not include. Players wanted more accuracy with character associated with Nulgath as tournament options and with 3 character already in the tournament which have secondary neutral. I debated about letting them in. But the people wanted accuracy more then potential balance concerns. In honestly at this time we have 45 characters instead of the original 38. If I were to let you all have the characters you want for this. I would have to include 42 additionals characters brought up. Making this an 87 character tournament Which would have more broken options. Pure neutral legendaries and Chaos Flux for example. When I made this release I wanted to give ya all a format where you can use the cool characters and cards ya all had. Especially the players who stayed with us. For this one big event since you deserve it for staying with us like ya did. With keep bans low while still being fairly balance to make it fair. My gift to the community. Now I'm seeing from the community I messed up royal apaprently. Where my choices are wrong for balence and story issues. Like this character should be going for power for example. Where I should have been more focus on accurancy and head cannon characters as choices then I did. So tell me now while I can still makes changes this to what you guys want. You want character accuracy, card balance, or anarchy? You want the Skexis in or out? Do you want add CC bans? The choices are yours since you have to fight with these conditions. So choose wisely. Some characters are to loyal to Nulgath to ever betray him. Card balance. Who fights a forum tournament for the story? I do since I don't need sgs. The result of this tournament has an actual effect on the OS story line. What's a head cannon character. I most likely won't sign up though.